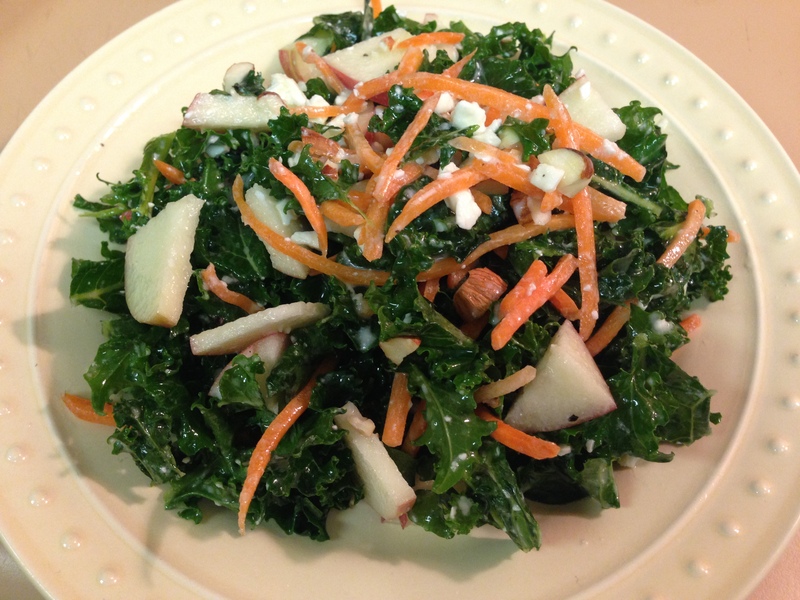 Kale salads – YUM! I’ve been eating quite a few lately. I bought fresh kale from the farmer’s market and have been using it in my morning protein shakes and in salads for lunch. It’s so simple, yet so delicious. Easy, healthy and delicious…my kind of salad! Squeeze the juice from one meyer lemon (or more if you are making many servings). I used fresh lemons from my parent’s Meyer Lemon tree (YUM!). Slowly whisk in the olive oil. Add as much as you prefer, depending on how big of a salad you’re making. Add salt and pepper to taste. If this dressing is too tart for your liking, feel free to add a little bit of honey to sweeten it up! Break the kale into small pieces. Toss with the dressing and let sit about 15 minutes, letting the kale absorb the dressing and soften. Meanwhile, chop up the fuji apple, shred the carrot, lightly toast the almonds over low heat and crumble the feta. Feel free to add some protein to make it a more substantial meal. Grilled salmon is my favorite addition to kale salads…or to anything really! Grilled tofu or chicken would be delicious as well. If you don’t have apple, another option is dried cranberries. You can also substitute the almonds with pecans or walnuts, or use goat cheese instead of feta. Endless possibilities!